Welcome to the High Life Highland newsletter. As ever there has been a lot happening and it has been difficult to capture everything. Two editions of the newsletter are published each year one each for summer and winter. The winter edition will come out in December and summer edition in June. 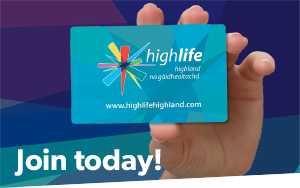 High Life Highland is a charity registered in Scotland, formed on the 1st October 2011 by The Highland Council to develop and promote opportunities in culture, learning, sport, leisure, health and wellbeing. We deliver a wide range of cultural, sporting, leisure, learning and health & wellbeing initiatives and projects across 9 services throughout the whole of the Highlands, for both residents and visitors.